The enormous microbial diversity in nature has been reported for many decades by multiple analyses of micro-organism communities in environmental samples [1-3]. The evolution of microorganisms associated with selective pres-sures in different habitats has produced their unparalleled physiological and biochemical diversity, in which enzymes play a key role in microbial adaptation [4,5]. The majority of industrial enzymes used nowadays has a microbial origin and have hydrolytic activity with quite diverse potential applications in different areas. Microbial enzymes are relatively more stable and have properties more diverse than other enzymes derived from plants and animals [6,7]. Among these hydrolytic enzymes, proteases occupy a pivotal position with respect to their applications in both physiological and commercial ﬁelds. Proteolytic enzymes catalyze the cleavage of peptide bonds in other proteins, and microorganisms elaborate a large array of intracellular and/or extracellular proteases [6-8]. Proteases are still the most dominant enzyme type in the market due to their extensive use in detergent and dairy industries . Various carbohydrases, primarily amylases and cellulases, represent the second largest group in the market . Amylases hydrolyze starch molecules to give diverse products, including dextrins and progressively smaller polymers composed of glucose units . A number of these starch-converting enzymes are alpha-amylase (E.C.3.2.1.1), one of the most important industrial amylases [11,12]. Microbial amylases have successfully replaced the chemical hydrolysis of starch in starch-processing industries and present potential applications in a number of industrial processes involving food, textile, and paper sectors . Carboxymethyl (CM) cellulases (EC 3.2.1.4), cellobiohy-drolases (EC 3.2.1.91), and β-glucosidases (EC 3.2.1.21), which are collectively known as cellulases, act in a synergistic manner to hydrolyze glycosidic bonds within cellulose molecules [14,15]. Cellulose has enormous potential as a renewable source of energy, and several microorganisms, including fungi and bacteria, use it as a carbon source [16,17]. In recent years, the interest in cellulases has increased due to their applications in the production of bioenergy and bio-fuel, in addition to their uses in beverage, paper, and textile industries [18-20]. Another group of hydrolytic enzymes includes esterases, which catalyze the cleavage and formation of ester bonds and are known as α/β-hydrolases. These enzymes are widely distributed in animals, plants, and microorganisms [21,22]. Esterases (EC 3.1.1.1, carboxyl ester hydrolases) hydrolyze esters of short chain carboxylic acids (≤ 12 carbon atoms) . They are one of the most used enzymes in organic synthesis and are commonly employed as additives in detergents [24,25]. Moreover, these enzymes have app-lications in cosmetics, paper and pulp production, and also as food additives . Screening of microorganisms from natural environments for enzyme production has already been published, especially in unconventional and extreme environments [27-30]. At the same time, comparison of the distribution of enzymes in natural environments such as soil, water, and plants, involving all the cultivable microorganisms in these habitats, is still missing. Furthermore, the study of the enzymatic profile of microorganisms in natural micro-environments can generate important environmental and industrial information. The present paper addresses a large-scale screening survey of extracellular enzyme production by microbial isolates from soil, water, and plants. In this study, we report the distribution and relative abundance of enzymes, including two proteases (gelatinase and caseinase), amylase, cellulase (more specifically CM cellulase), and esterase, in different natural environmental samples, as well as the evaluation of the biotechnological potential of the microorganisms present in nature. A total of 12 samples of fresh water, 19 of soil, and 20 of plants were collected in Minas Gerais, Brazil, in a region characterized by Atlantic forest. These samples were col-lected randomly, without specific parameters (for example, both surface and subsurface water were collected). Micro-organisms were isolated after dilution of the samples and plating on LB agar (Phoneutria, Belo Horizonte, Brazil). After incubation at 25 ºC for 48-72 h, colonies of distinct morphological appearances were cultured in the same media to obtain pure isolates, which were then maintained in LB broth (Phoneutria) supplemented with 50% (v/v) fetal bovine serum and kept at -80 ºC. The isolates were inoculated in 2 ml of LB broth (Phoneutria) in a 96-well plate. After 24 h at 25 ºC and 30 Hz agitation, 2 µl of culture were inoculated in enzyme-specific media, according to the methodology described by Facchin et al. . Enzymatic activities were determined after incubation at 25 ºC for 24 h for each of the tested enzymes. For the detection of proteolytic activity, the isolates were cultured in casein–agarose [1% (w/v) agarose, 1 mM CaCl2, and 10% (v/v) casein in 1X PBS pH 7.4] to detect caseinase activity and gelatin media [2 ml of media/assay tube: 50 mM Tris-HCl pH 6.8, 1 M CaCl2, and 10% (w/v) gelatin] to detect gelatinase activity. Caseinase activity was detected by the presence of a clear halo in the media after incubation with 1 M HCl solution to precipitate the remaining casein. Gelatinase activity was detected by liquefaction of the media . For the determination of amylase activity, the isolates were inoculated in corn starch–agarose: 1% (w/v) agarose, 50 mM Tris-HCl pH 6.8, 1 mM CaCl2, and 0.5% (w/v) corn starch. After incubation period, the culture plates were flooded with 2% iodine solution to colorize the remaining starch, and the amylase-producing isolates showed a clear halo . In order to verify esterase activity, isolates were screened for the production of esterase in tributyrin–agarose: 1% (w/v) agarose, 50 mM Tris-HCl pH 6.8, 1 mM CaCl2, and 0.6% (v/v) tributyrin emulsion. Esterase-producing isolates showed a clear zone surrounding their colonies after incubation . For detection of cellulase activity, the isolates were inoculated in carboxymethyl cellulose–agarose: 1% (w/v) agarose, 50 mM Tris-HCl pH 6.8, 1 mM CaCl2, and 0.5% (w/v) carboxymethyl cellulose. After incubation, the medium was stained for 30 min with Congo red (0.25% in 0.1 M Tris-HCl, pH 8.0), followed by destaining (0.5 M NaCl, 0.1 M Tris-HCl, pH 8.0) for 5 min. The detection of CM cellulase-producing isolates was observed by the presence of a clear zone around the strain growth [31, 32]. The data for the enzyme distribution in soil, water, and plants were statistically compared using the chi-squared test (P < 0.05) by GraphPad Prism version 5.03 for Windows (GraphPad Software, San Diego, CA, USA). The potential of microbial isolates from environmental samples for extracellular enzyme production was charac-terized. Of the 51 environmental samples analyzed, 346 isolates were obtained, including bacteria and fungi. Only 36 isolates were not able to produce any enzyme tested. Among the isolates, 310 produced at least one of the five tested enzymes (Table 1). As shown in Fig. (1), considering each enzyme separately, 82.6%, 50.6%, 42.9%, 40.3%, and 24.5% of the isolates produced caseinase, esterase, gelatinase, CM cellulase, and amylase, respectively. Percentage of microbial isolates from environmental samples (from soil, water and plant) producing each of five different extracellular hydrolytic enzymes studied. 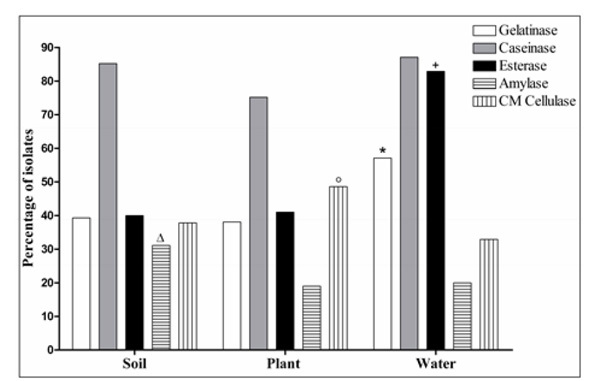 Percentage of microbial isolates from soil, plant, and water samples with activity of each of the five investigated enzymes (* +, P < 0.05 compared to soil and plant samples; Δ, P < 0.05 compared to plant samples; ○, P< 0.05 compared to water samples). Number of microbial isolates producing one or more of the five investigated hydrolytic enzymes. Number of microbial isolates from environmental samples producing or not producing the investigated enzymes. A = Number of isolates producing enzymes; B = Number of isolates producing no enzymes. Caseinase was the enzyme most produced in all three types of samples: 85.2% of the isolates from soil, 75.2% from plants, and 87.1% from water (Fig. 2). However, among all samples, the enzyme amylase was found with the lowest frequencies. With respect to soil (N = 135 enzyme producing isolates), isolates producing amylase were significantly more numerous than in plants. One isolate from soil sample (S27) produced all five enzymes analyzed (gelatinase, esterase, caseinase, amylase, and CM cellulase). In this present report, leaves, flowers, seeds, and stems of living and decomposing plants were collected randomly and microorganisms were isolated from both the surface and inside of plants. 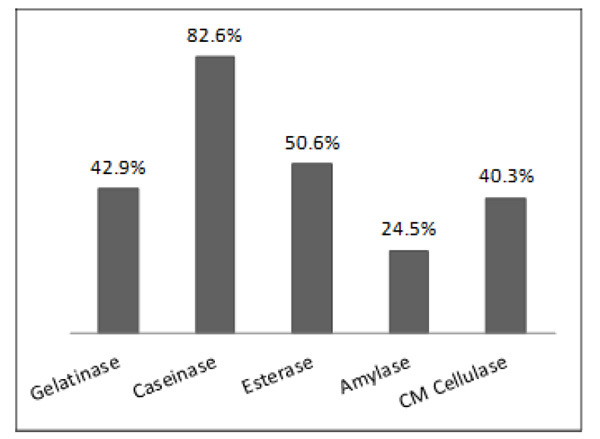 CM cellulase was found more frequently in plant samples (N = 51 isolates producing CM cellulase) compared to water samples (N = 23 isolates producing CM cellulase) (P < 0.05). In particular, two plant samples (P1: decomposing plant; and P17: seeds) presented isolates producing only CM cellulase. In the present report, esterase and gelatinase were found to be produced more frequently in water samples (N=70 enzyme producing isolates), compared to soil and plant samples, based on statistical analysis. In this study, all 12 isolates from a unique water sample (W51; Table 1) produced esterase, and the majority of the isolates (10 of 12) presented the following enzymatic profile: gelatinase, esterase, and caseinase production. Many isolates (N = 239) produced more than one of the tested enzymes (Fig. 3). Only one isolate (from soil sample S27) produced all five analyzed enzymes as mentioned previously. Isolates producing gelatinase, esterase, and caseinase were the most frequently found (N = 60 isolates). A total of 71 isolates produced only one of the analyzed enzymes: 31, 23, 15, and 2 isolates produced only caseinase, CM cellulase, esterase, and gelatinase, respectively. No microorganism that degrades only amylase was isolated. Prokaryotic and eukaryotic microorganisms make a vital contribution to biogeochemical cycles, in addition to their uses in waste treatment, water supply and regulation, and healthy soils for farming. In this context, microbial hydro-lytic enzymes play an essential role in the decomposition of natural compounds such as organic carbon and nitrogen [2, 28, 33]. In a previous report, 39.8%, 15.6%, and 5.4% of yeast strains from tropical environments produced esterase, protease, and amylase, respectively . In an environment with extreme climatic conditions such as Antarctica, it was shown that proteases and esterases also were frequently found . In the present report, enzyme-producing micro-organisms were isolated from all environmental samples analyzed, reflecting the presence of enzyme substrates in these habitats. 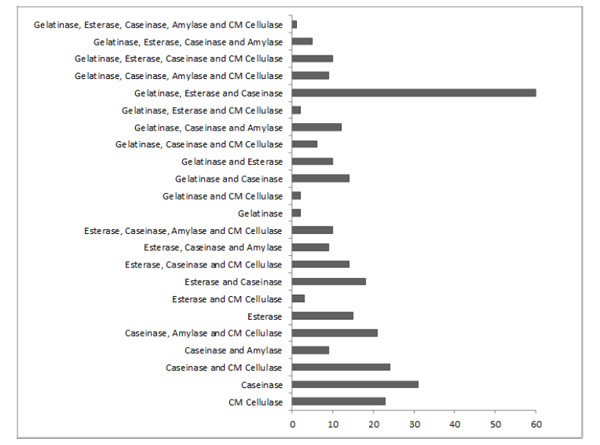 Caseinase was the enzyme most produced in soil, plant, and water, whereas amylase was found with the lowest frequencies. However, as the microbial colonies with the same morphological appearances were not quantified, it is not known whether there were fewer amylase-producing isolates than other enzyme-producing isolates in the sample, considering the total number of cultivable microorganisms. Enzymatic activity is associated with site-specific factors such as temperature, moisture, and substrate availability . The differences found in the enzymatic distribution between the water, soil, and plant samples in this work could be associated to conditions prevailing in these natural habitats. Various studies have analyzed microbial enzymatic diversity in soil using culture-independent techniques. Rondon et al. did not find esterase, protease, or cellulase activity in soil, whereas amylase activity was found. However, other reports have found esterase, cellulase, and protease activities in soil [38-41]. In this study, isolates producing amylase were more numerous in soil than in plants. Soil amylase mainly has a microbial origin, although it also exists intracellularly in plants and can be released during litter formation . Soil is a complex system that includes a range of microhabitats with different physicoche-mical characteristics and discontinuous environmental conditions. In the present report, one isolate from soil sample produced all five tested enzymes. Organisms that share the same microhabitat may contribute to nutrient availability on the site, hence the production of various enzymes is important. Plants are attractive hosts for microorganisms because they provide a variety of nutrients. Plant-associated micro-organisms can be considered as pathogens, mutualists, or commensals . With this range of associations, microbial hydrolytic enzymes are essential to harm or benefit the plant. According to Jalgaonwala and Mahajan , the order of enzymatic activities for microorganisms from plants is as follows: proteolytic > amylolytic > cellulolytic > esteratic. In nature, cellulose is found mainly as a structural component of plant cell walls, which are mostly composed of cellulose , which may explain the observed results in the present study (CM cellulase was predominant in plants compared to water). In addition, in this work, isolates producing only CM cellulase were found in two plant samples. Cellulose probably has a key role in providing microbial nutrition in these microenvironments, being the principal carbon source possibly because of its abundance. This isolates might be important for the initial hydrolysis of cellulose in these microhabitats. In this report, esterase and gelatinase were found to be produced more frequently in water samples. Esterase activity can be a good index for estimating organic matter content in the sea, lakes, and reservoirs [46-48]. In water samples, it is possible to find 100% of isolates having proteolytic and esterase activities, but amylolytic activity is more rarely encountered . In a yeast screening study, cellulolytic activity was shown to predominate in aquatic habitats . In this study, all isolates from a unique water sample produced esterase, and the majority of the isolates were able to produce gelatinase, esterase, and caseinase. It is possible that the substrate for esterase can frequently be found in this microenvironment, and it is probable that the predominance of this enzymatic profile is associated with natural selection acting on adapted microorganisms. The interactions between microorganisms and organic matter are of extreme impor-tance in the functioning of aquatic environments. In this context, the organic matter composition, together with other physicochemical conditions of the environment, controls the activity and structure of microbial communities . Microorganisms with combined hydrolytic activities may have applications in biotechnological processes involving multiple enzymes, like in wastewater treatment generated by dairy, food, paper, and other industries . In this work, many isolates produced more than one of the enzymes analy-zed. Other studies have also detected combined hydrolytic activities in a number of strains from extreme environments [27, 52]. However, some isolates produced only one of the tested enzymes. Production of only one enzyme may represent a key function for these micro-organisms because the substrate for this enzyme may have a more important role in the microbial metabolism of these isolates than other substrates present in the same habitat. Thus, interactions between microorganisms with different enzymatic profiles can provide a synergistic environment with intermediate decomposition products released . No microorganism that degrades only amylase was isolated. A possible explanation is that starch is not abundant in the tested microenvironments. In the present work, numerous microbial isolates from nature were screened for production of extracellular hydrolytic enzymes. Almost all of the isolates produced at least one analyzed enzyme, and most of them produced more than one. It was possible to determine the distribution of microbial enzymes in water, soil, and plant samples. In addition, a predominance of certain enzymes was found, depending on the type of environmental sample. Together, these findings suggest important differences in microbial populations and biochemical activities between soil, water, and plants and the microhabitats in these natural environments. Microorganisms present in nature represent a great resource for biotechnological exploration of products and processes, making it possible to discover enzymes with new properties and applications. Therefore, these results could provide basic data for further investigations on microbial hydrolytic enzymes in soil, plants, and water. The authors would like to thank Conselho Nacional de Desenvolvimento Cientı́fico e Tecnológico (CNPQ) for financial support (Priscila D. D. Alves - project numbers: 580311/2008-2, 551113/2011-1, and 300721/2012-9; Flávia F. Siqueira - project number: 551113/2011-1; research conducted at the Phoneutria Biotecnologia e Serviços Ltda. - project number: 560912/2010-2), as well as Luiz Felipe Ribeiro and Cleidiana Bárbara Gomes for their help during the laboratory experiments. Torsvik V, Salte K, Sø.rheim R, Goksøyr J. Comparison of phenotypic diversity and DNA heterogeneity in a population of soil bacteria. Appl Environ Microbiol 1990; 56: 776-81. Ranjard L, Poly F, Combrisson J , et al. Heterogeneous cell density and genetic structure of bacterial pools associated with various soil microenvironments as determined by enumeration and DNA fingerprinting approach (RISA). Microb Ecol 2000; 39: 263-72. Vandenkoornhuyse P, Baldauf SL, Leyval C, Straczek J, Young JPW. Extensive fungal diversity in plant roots. Science 2002; 295: 2051. Arnold FH, Wintrode PL, Miyazaki K, Gershenson A. How enzymes adapt: lessons from directed evolution. Trends Biochem Sci 2001; 26: 100-6. Lorenz P, Schleper C. Metagenome - a challenging source of enzyme discovery. J Mol Catal B Enzyme 2002; 19: 13-9. Rao MB, Tanksale AM, Ghatge MS, Deshpande VV. Molecular and biotechnological aspects of microbial proteases. Microbiol Mol Biol Rev 1998; 62: 597-635. Mohapatra BR, Bapuji M, Sree A. Production of industrial en-zymes (amylase.carboxymethylcellulase and protease) by bacteria isolated from marine sedentary organisms. Acta Biotechnol 2003; 23: 75-84. Gupta R, Beg QK, Lorenz P. Bacterial alkaline proteases: molecular approaches and industrial applications. Appl Microbiol Biotechnol 2002; 59: 15-32. Godfrey T, West S, Godfrey T, West S, Eds. Introduction to industrial enzymology. London: Macmillan Press: Industrial Enzymology. 1996; pp. 1-8. Windish WW, Mhatre NS, Eds. Microbial amylases In Wayne WU Advances in Applied Microbiology. New York Academic Press. 1965; pp. 273-304.
 van der Maarel MJEC, van der Veen B, Uitdehaag JCM, Leemhuis H, Dijkhuizen L. Properties and applications of starch-converting enzymes of the a-amylase family. J Biotechnol 2002; 94: 137-55. Gupta R, Gigras P, Mohapatra H, Goswami VK, Chauhan B. Microbial a-amylases: a biotechnological perspective. Process Biochem 2003; 38: 1599-616. Pandey A, Nigam P, Soccol CR, Soccol VT, Singh D, Mohan R. Advances in microbial amylases. Biotechnol Appl Biochem 2000; 31: 135-52. Béguin P. Molecular biology of cellulose degradation. Annu Rev Microbiol 1990; 44: 219-48. Akiba S, Kimura Y, Yamamoto K, Kumagai H. Purification and characterization of a protease-resistant cellulase from Aspergillus niger. J Ferment Bioeng 1995; 79: 125-30. Coral GK, Arikan B, Naldi MN, Venmez HG. Some properties of crude carboxymethyl cellulase of Aspergillus niger Z10 wild-type strain. Turk J Biol 2002; 26: 209-13. Onsori H, Zamani MR, Motallebi M, Zarghami N. Identification of over producer strain of endo-ß-1.4-glucanase in Aspergillus Species: Characterization of crude carboxymethyl cellulase. Afr J Biotechnol 2005; 4: 26-30. Ahamed A, Vermette P. Culture-based strategies to enhance cellulase enzyme production from Trichoderma reesei RUT-C30 in bioreactor culture conditions. Biochem Eng J 2008; 40: 399-407. Gao J, Weng H, Zhu D, Yuan M, Guan F, Xi Y. Production and characterization of cellulolytic enzymes from the thermoacidophilic fungal Aspergillus terreus M11 under solidstate cultivation of corn stover. Bioresour Technol 2008; 99: 7623-9. Zhou J, Wang YH, Chu J, Zhuang YP, Zhang SL, Yin P. Identification and purification of the main components of cellulases from a mutant strain of Trichoderma viride T 100-14. Bioresour Technol 2008; 99: 6826-33. Ollis DL, Shea E, Cygler MB, Dijkstra B, Frolow F. The a/ß hydrolase fold. Protein Eng 1992; 5: 197-211. Bornscheuer UT. Microbial carboxyl esterases: classification. properties and application in biocatalysis. FEMS Microbiol Rev 2002; 26: 73-81. Eggert T, Pouderoyen GV, Pencreach G , et al. Biochemical properties and three dimensional structures of two extracellular lipolitic enzymes from Bacillus subtilis. Colloids Surf B Biointerfaces 2002; 26: 37-46. Atomi H. Recent progress towards the application of hyperthermophiles and their enzymes. Curr Opin Chem Biol 2005; 9: 166-73. Tutino ML, Prisco G, Marino G, Pascale D. Cold-adapted esterases and lipases: from fundamentals to application. Protein Pept Lett 2009; 16: 1172-80. Ranjitha P, Karthy ES, Mohankumar A. Purification and partial characterization of esterase from marine Vibrio fischeri. Mod Appl Sci 2009; 3: 73-82. Sánchez-Porro C, Martín S, Mellado E, Ventosa A. Diversity of moderately halophilic bacteria producing extracellular hydrolytic enzymes. J Appl Microbiol 2003; 94: 295-300. Dang H, Zhu H, Wang J, Li T. Extracellular hydrolytic enzyme screening of culturable heterotrophic bacteria from deep-sea sediments of the Southern Okinawa Trough. World J Microbiol Biotechnol 2009; 25: 71-9. Vaz ABM, Rosa LH, Vieira MLA , et al. The diversity. extra-cellular enzymatic activities and photoprotective compounds of yeasts isolated in Antarctica. Braz J Microbiol 2011; 42: 937-47. Emimol A, Ganga G, Parvathy R, Radhika G, Nair GM. Screening of microbes producing extracellular hydrolytic enzyme from corporation waste dumping site and house hold waste for the enhancement of bioremediation methods. IOSR-JPBS 2012; 4: 54-60. Facchin S, Alves PDD, Siqueira FF, Barroca TM, Victória JMN, Kalapothakis E. Biodiversity and secretion of enzymes with potential utility in wastewater treatment. Open J Ecol 2013; 3: 34-47. Ruegger MJS, Tauk-Tornisielo SM. Atividade da celulase de fungos isolados do solo da Estação Ecológica de Juréia-Itatins São Paulo Brasil. Rev Bras Bot 2004; 27: 205-11. Schneider T, Riedel K. Environmental proteomics analysis of structure and function of microbial communities. Proteomics 2010; 10: 785-98. Buzzini P, Martini A. Extracellular enzymatic activity profiles in yeast and yeast-like strains isolated from tropical environments. J Appl Microbiol 2002; 93: 1020-5. Loperena L, Soria V, Varela H, et al. Extracellular enzymes produced by microorganisms isolated from maritime Antarctica. World J Microbiol Biotechnol 2012; 28: 2249-56. Sinsabaugh RL. Enzymic analysis of microbial pattern and process. Biol Fertil 1994; 17: 69-74. Rondon MR, August PR, Bettermann AD , et al. Cloning the soil metagenome a strategy for accessing the genetic and functional diversity of uncultured microorganisms. Appl Environ Microbiol 2000; 66: 2541-7. Garcia C, Hernandez T, Costa F. Microbial activity in soils under Mediterranean environmental conditions. Soil Biol Biochem 1994; 26: 1185-91. Lee SW, Won K, Lim HK, Kim JC, Choi GJ, Cho KY. Screening for novel lipolytic enzymes from uncultured soil microorganisms. Appl Microbiol Biotechnol 2004; 65: 720-6. Barman D, Saud ZA, Habib MR, Islam MF, Hossain K, Yeasmin T. Isolation of cellulytic bacterial strains from soil for effective and efficient bioconversion of solid waste. Life Sci Med Res 2011; 25: 1-6. Fujii K, Oosugi A, Sekiuchi S. Cellulolytic microbes in the Yanbaru a subtropical rainforest with an endemic biota on Okinawa Island Japan. Biosci Biotechnol Biochem 2012; 76: 906-11. Ebregt A, Boldewijn JMAM. Influence of heavy metals in spruce forest soil on amylase activity CO2 evolution from starch and soil respiration. Plant Soil 1977; 47: 137-48. Berlec A. Novel Techniques and findings in the study of plant microbiota Search for plant probiotics. Plant Sci 2012; 193: 96-102. Jalgaonwala RE, Mahajan RT. Evaluation of hydrolytic enzyme activities of endophytes from some indigenous medicinal plants. IJAT 2011; 7: 1733-41. Quiroz-Castañeda RE, Folch-Mallol JL. Plant cell wall degrading and remodeling proteins current perspectives. Biotechnol Appl 2011; 28: 205-15. Poremba K, Hoppe H-G. Spatial variation of benthic microbial production and hydrolytic enzymatic activity down the continental slope of the Celtic Sea. Mar Ecol Prog Ser 1995; 118: 237-45. Boschker HTS, Cappenberg TE. Patterns of extracellular enzyme activities in littoral sediments of Lake Gooimeer. The Netherland FEMS Microbiol Ecol 1998; 25: 79-86. Wobus A, Bleul C, Maassen S , et al. Microbial diversity and functional characterization of sediolments from reservoirs of different trophic states. FEMS Microbiol Ecol 2003; 46: 331-47. Ong KS, Chin HS, Teo KC. Screening of antibiotic sensitivity. antibacterial and enzymatic activities of microbes isolated from ex-tinmining lake. Afr J Microbiol Res 2011; 5: 2460-6. Brandão LR, Libkind D, Vaz ABM , et al. Yeasts from an oligotrophic lake in Patagonia (Argentina): diversity. distributionand synthesis of photoprotective compounds and extracellular enzymes. FEMS Microbiol Ecol 2011; 76: 1-13. Chróst RJ. Significance of bacterial ectoenzymes in aquatic environments. Hydrobiologia 1992; 243/244: 61-70. Carrasco M, Rozas JM, Barahona S, Alcaíno J, Cifuentes V, Baeza M. Diversity and extracellular enzymatic activities of yeasts isolated from King George Island. the sub-Antarctic region. BMC Microbiol 2012; 12: 251-9. Romaní AM, Fischer H, Mille-Lindblom C, Tranvik LJ. Interactions of bacteria and fungi on decomposing litter: Differential extracellular enzyme activities. Ecology 2006; 87: 2559-69.